KNOXVILLE, TN — The numbers are scary, 5 million deaths yearly make diabetes the 8th leading cause of death in the world. In addition to the high number of deaths, diabetes accounts for 5% of the world’s blindness. 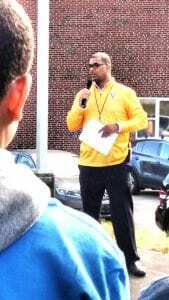 Vine Middle School Principal Clarence Swearengen talking to his students and the crowd about the life changes he made as a diabetic. Lions Club International has set an aggressive goal beginning in 2018 to hold events worldwide to raise awareness about avoidance, control and prevention of diabetes to help prevent blindness and improve quality of life. It is estimated one in eleven people in the world have diabetes with 46% undiagnosed. The Knoxville East Lions Club, the largest club in Tennessee, working with Lions International, the University of Tennessee football team, and the students of Vine Middle School, came together to create an event to raise awareness about diabetes that will be seen around the world during the Peach Bowl football game, scheduled to be played Monday, January 8th in the new Mercedes-Benz Football stadium in Atlanta Georgia. On the first chilly Fall Saturday in September, members of the University of Tennessee football team and students of Vine Middle, gathered in the field behind the middle school to play a flag football game with one goal in mind: show the need of exercise and proper diet in the fight to prevent diabetes. The game was complete with a production crew, referees, lions serving as cheerleaders and fans. Music was provided by the great University of Tennessee Sterl The Pearl” Sterling Henton, former quarterback for UT. Sterl came and set up his equipment to pump up the crowd, play music and broadcast the kids game just as he does when he plays for the 100,000 who attend the UT Home games. Giving credence to the need of starting early in life with good health practices, the principal of Vine Middle School, Mr. Clarence Swearengen, gave his testimony to the crowd of how he is a diabetic and how a life crisis woke him up and caused him to lose weight and make life changing habits to control his diabetes. The students who played and watched were also given examples of proper snacks and drinks and handouts on the facts about diabetes. The game and the testimonials will be part of the Peach Bowl presentations during the game.